Pop Culture Classroom, the Colorado-based education nonprofit behind Denver’s largest pop culture convention, has announced that the event known as Denver Comic Con is now Denver Pop Culture Con. 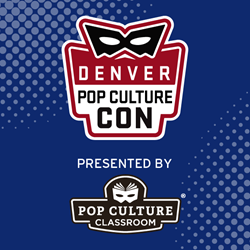 The Pop Culture Classroom leadership team has been considering a name change for several years to create brand alignment across the organization’s name and its signature events, including Denver Pop Culture Con and Reno Pop Culture Con, a new event debuting in 2019. The new name is meant to encompass everything that goes on at the con — comics, television and film, authors, cosplay, workshops, educational programming, and all other aspects of pop culture fandom Denver Comic Con has grown to encompass since its inception. With the addition of Reno Pop Culture Con, now is the ideal time for the name change. Pop Culture Classroom is focused on ensuring both the Denver and Reno shows are world-class, inclusive events. Denver Pop Culture Con will have “throwback” sales on previous years’ merchandise featuring the Denver Comic Con brand, and merchandise with the new branding will be available soon. Tickets for Denver Pop Culture Con 2019 go on sale November 13, 2018 at 10:00 a.m. MST for 2018 Speed Pass holders and November 14 at 10:00 a.m. MST for the general public. Fans can keep up with all of the latest news and information about Denver Pop Culture Con and Reno Pop Culture Con on social media and at the links below. Denver Pop Culture Con (fka Denver Comic Con) is a 3-day, family-friendly pop culture fan extravaganza, featuring the best in pop culture entertainment. DPCC is a program of the Colorado nonprofit Pop Culture Classroom, whose mission is to inspire a love of learning, increase literacy, celebrate diversity and build community through pop culture education. The proceeds from this annual event benefit Pop Culture Classroom’s overall educational endeavors. DPCC promotes education and community through pop culture, comics and the bringing together diverse people and interests regardless of age, race, gender or background. We strive to promote tolerance and empower the members of our community through educational programming, guests, and events that encourage diversity and inclusion.